Wake Forest University is featured this month in Beyond Computing magazine as a winner of the magazine’s second annual Partnership Awards. Wake Forest is among 10 winners recognized in the magazine’s October issue as having successfully aligned their information technology operations with their primary missions. Wake Forest, the only university in the group, was presented the silver award. Other recipients included representatives of various industries: insurance, banking and financial services, manufacturing, distribution, chemicals, pharmaceuticals, and healthcare. Wake Forest’s award was presented at a New York City ceremony to John P. Anderson, vice president for finance and administration, and Jay Dominick, assistant vice president for information systems. 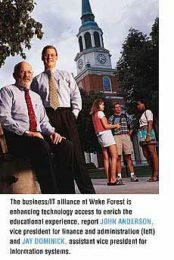 In fall 1996, Wake Forest launched a new undergraduate plan designed to enhance the learning experiences of students through new technology, classes, faculty, and more. Since that time, the university has attracted national attention for providing IBM laptop computers to students, wiring residential and classroom buildings to provide Internet access practically everywhere on campus, and introducing new software into classes to encourage collaborative learning. Beyond Computing notes that Wake Forest’s successful introduction of new technology has come about through extensive teamwork. In the magazine, Anderson comments that the key to success has been “applying old-fashioned values — teamwork and doing things right the first time — to even the latest technological initatives.” Anderson explains that the university’s academic and technology communities have worked together to bring computer technology into the classroom at Wake Forest.